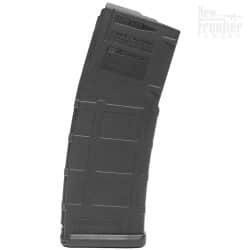 The reliability of a steel magazine, the durability of a polymer magazine and the weight of an aluminum magazine. 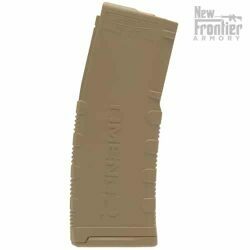 The Lancer Systems L5 Advanced Warfighter AR-15 Magazine fills the gap between the current metal and polymer magazine designs, combining the best features from both designs into a unique hybrid magazine. Unique to the L5AWM is the one piece wrap‐around hardened steel feed lip assembly that is permanently attached to an impact resistant polymer body. The hardened steel feed lips won’t bend, break or deform due to rough handling or long term storage. An aggressive surface texture has been applied to the polymer body to improve gripping and retrieval from pouches. The combination of steel and polymer result in a lightweight, robust magazine tough enough for professional use. 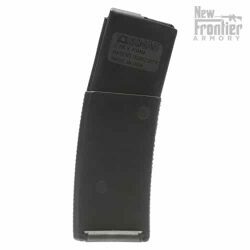 The internal geometry of the Advanced Warfighter Magazine is a constant curve to maximize feed to the 5.56X45mm NATO round with a non‐tilting follower for trouble‐free feeding. The feed lips are made from a single piece of precision formed steel that is hardened, then PTFE coated for corrosion resistance. The body and component materials are corrosion and chemical resistant, passing military chemical testing, including exposure to DEET. The L5AWM is compatible with modern weapon systems; M4/M16/AR, HK416, SCAR16, and the ARX160, to name a few. Let me start by saying that I was pretty burned by poly mags, the Tapco and the Gen 1 Magpul both had serious problems. The Tapco feed lips spread open and caused double feeding, and the Magpuls just split. I was done with poly until I found these L5s. These Lancers are the only mags I use now. I found 2 that I had left loaded for more than a year. The Tapco or the Gen1 Magpul, I haven’t used any since then, would have failed. The L5s, still run like a sewing machine. 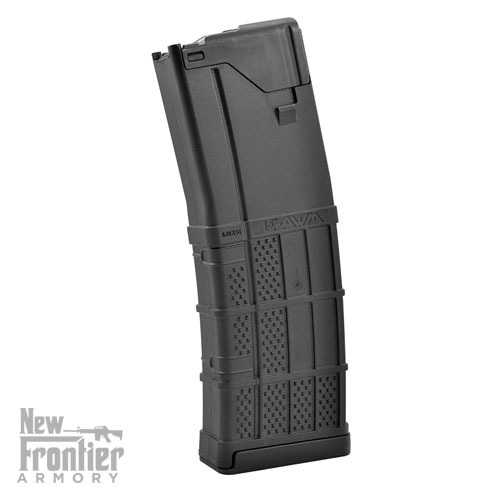 In short, all of the good and none of the bad with poly mags. They have the textured grip that makes them easy to manipulate even when wet, muddy or with a gloved hand. They snap tightly into the magwell and drop free cleanly. They are a tight fit in most mag pouches. 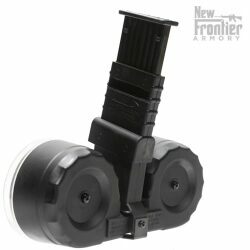 Mag assists from Magpul solve that. Those are a tight fit on these as well, but they do go on. Warm them up first with a hair dryer. If the base were more like the Ranger Plate, these would be the perfect magazine.